Scoliosis is an abnormal curvature of the spine as viewed from the back, meaning the spine curves sideways towards one shoulder or another and then back again. The more pronounced the curve, the more it affects posture and breathing. Scoliosis is not that uncommon, being found in about 10% of adolescents, and most instances of the disorder cause no other physical problems and do not require treatment. 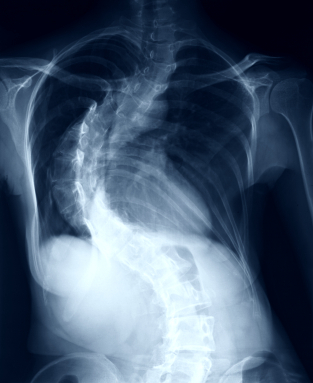 More severe cases of scoliosis, however, may cause muscular strain or fatigue, loss of physical strength, and diminished self-esteem due to a visible physical deformity. There is a wide range of available treatments, including medication, braces, and surgery, and scoliosis research is ongoing. The Sonoran Spine Research and Education Foundation (SSREF) has set up a scholarship fund that contributes to college expenses for students enrolled at Arizona State University, University of Arizona, or Northern Arizona University who have had surgery to correct a spinal condition like scoliosis. The foundation provides the money, but the scholarships are administered by the individual schools. Note: although the University of Arizona is listed on SSREF’s website, the university’s website makes no mention of the SSREF scholarship. Northern Arizona University does list the scholarship, but provides no details or link. That leaves Arizona State University, which devotes a page to the SSREF scholarship. To be considered for funding, an applicant must be a full-time student with a medically verifiable spinal deformity, and attach a doctor’s stated diagnosis (on letterhead) to the online application. You must be able to show financial need, which requires filing a Free Application for Federal Student Aid, and demonstrate your personal involvement with your school or community. No particular GPA is required, and students in any college year, including graduate school, may apply. The award is renewable if funding permits and you continue to meet the qualifying standards, and the amount given can be as much as $1,000. A group called Stickler Involved People underwrites the Dr. Gunnar B. Stickler Scholarship, in honor of the physician for whom Stickler syndrome is named. Stickler syndrome is a genetic disorder that affects connective tissue, and one of its symptoms is scoliosis. The scholarship is for graduating high school seniors, and provides $500 for each year of college up to four years. You may attend any accredited school of the following types: four-year college or university, community or junior college, or vocational/technical school, and your GPA must be equivalent to 3.0 on a four-point scale. The GPA requirement must be met in each semester of college, and if that does not occur, your award will be suspended until you achieve a 3.0 in two consecutive semesters. You must include a letter from your primary care physician or a geneticist (on letterhead) verifying that you are afflicted with Stickler syndrome. The Scoliosis Research Society (SRS) funds the Global Outreach Program Educational Scholarship. This one-time award pays attendance costs (as much as $2,500) for doctors involved in spinal surgeries to travel to one of two events, the SRS Annual Meeting & Course or the International Meeting on Advanced Spine Techniques. The money is intended to pay for travel and hotel expenses, while registration fees for the events are waived. Previous attendees at one of the conferences are not eligible, and applicants must be orthopaedists or neurosurgeons less than 45 years old. Another possible avenue of approach to financial aid is through some of the scholarships that don’t specify a disability but support the physically disabled student population in general. A discussion of details on some of those options follows. The John and Ruth Childe Scholarship for $1,000 is for students who graduated from a high school in Lee County, Florida. The Anne M. Fassett Scholarship is reserved for disabled students who use wheelchairs and either graduated from a high school in one of five Florida counties (Charlotte, Collier, Glades, Hendry, or Lee), or will attend school in Florida. The amount given varies, and you must show financial need. The American Association on Health and Disability also offers scholarships, not to exceed $1,000 each, and disabled students in professional fields that will let them help other disabled people receive preference. Examples of those fields are public health, disability policy and research, and promotion of health. If you are an undergraduate, you must attend school full-time, although part-time enrollment is permissible for graduate students. You must provide some verification of your disability, and you must be either a U. S. citizen or legal resident. The Foundation for Science and Disability has established a fund called The Student Award Program of FSD, which provides financial assistance for graduate and professional students with disabilities. This effort focuses on students in the STEM disciplines, and makes $1,000 awards to those in any of the following fields: science, technology, engineering, mathematics, or medicine. The most recent student grant paid for research into the reproductive habits of two types of disease-bearing sand flies. You can find more tips on scholarships for the disabled here.